Would you believe time travel was possible? I wouldn’t and neither did Leo … until a small time machine appears in his room and he sees a tiny girl and another rider…Himself! When he starts to search for this mystery girl, he finds the New-York Circulating Material Repository, a magical library which lends out famous and even magical objects instead of books. Hidden away in the storage is the Wells Bequest, which holds all the sci-fi machines in all books, including a shrink ray, lasers, robots and that time machine. When Simon, a worker at the NY Repository, threatens the others with Tesla’s death ray, Leo must attempt a journey to 1895 to stop this contraption from ever getting into Simon’s hands. When I opted to review this book, I was under the impression it was the sequel to “The Grimm Legacy”. It’s not … exactly. More of a book that has some of the same settings. 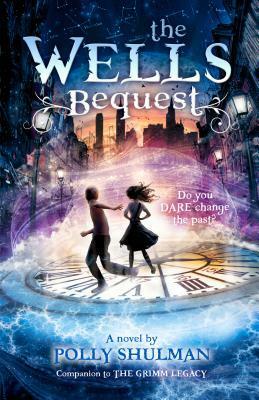 I admit to being disappointed I didn’t get to see more of the characters I’d come to love in the first book, but once I got past that, I enjoyed The Wells Bequest for what it was instead of being frustrated for what it wasn’t. Packed full of history, mystery, and of course the romance between characters, The Wells Bequest has a great plot for readers who love science fiction, the great inventions created, and who enjoy learning something new about the world’s greatest inventors. I especially enjoyed when Leo and the mystery girl, Jaya, must go back to fix what Simon has done to the fabric of time, without ripping their own future to shreds. Truthfully, the story was a little slow in the beginning, and I found it easy to set the book aside, but after the first five chapters, Polly Shulman had me hooked. It was a real page turner at the end, and it was hard to predict what else might pop out around the corner.